Everyone has been to weddings where the adorable little boy acting as the ring bearer steals the show as he walks down the aisle in his adorable ring bearer outfits. Some may have attended a ceremony where the couple’s dog acts as the ring bearer as well. What many of us do not know, however, is how the tradition of the ring bearer began. The fact is, there are many different explanations regarding the history of the ring bearer, each having deep roots in different cultures. 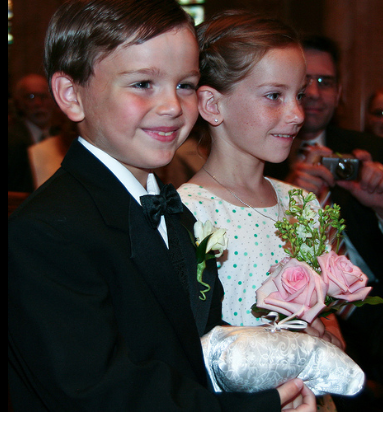 One of the most common beliefs regarding ring bearers dates back to Ancient Egypt. During that era it was common for treasured jewels to be carried on ornamental pillows during celebrations, especially wedding ceremonies. Although many historians believe that adults carried the rings on the ornamental pillows during Egyptian times, today it is more common for a young boy wearing ring bearers outfits such as boys tuxedos to perform the duties. Other historians trace the origin of the ring bearer to Medieval times, when a young child, known as a page boy, carried the bride’s train down the aisle while holding a book of prayers. Page boys did not carry the rings, as they were presented to the couple on the tips of swords. Because pillows were rare during the era, wealthy families replaced the swords with pillows as a symbol of their riches, and the page boy was given the duty of carrying the pillow, often wearing ring bearer outfits. The ring bearer grew in popularity during the Victorian Era, when boys suits consisted of velvet jackets, short trousers and round linen collars. Often, the ring bearer outfits included large bows of white crepe used to fasten the collar, unlike today when ring bearers wear boys tuxedos that match the other groomsmen. Whether a couple chooses one of their own children, a friend or relative’s child, or the family dog as a ring bearer, it is important to remember the rich tradition that comes with adding the element to the wedding ceremony. Seeing a small child walking down the aisle in ring bearer outfits carrying a pillow almost as big as they are often brings smiles to those in attendance.